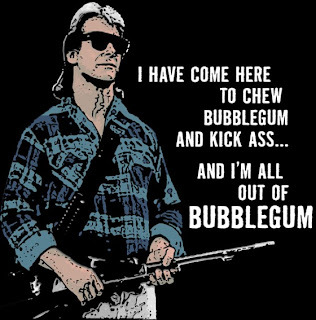 Wrestling Legend Rowdy Roddy Piper, Meg Foster, and Keith David will be having a They Live movie reunion at Texas Frightmare Convention on May 4,5, 6 2012 in Dallas Texas. I am going to the event and look forward to meeting the cast. They Live is one of my all time favorite movies. One of John Carpenter's best films without a doubt the fight scene is a classic! Tonight's Season Final was great, I have to say looks like they will finally be getting off the farm just hate having to wait until the Fall for the new season. We were also introduced to The Hooded Stranger. A mysterious figure saves Andrea as she runs through the woods with zombies all around her. And salvation comes in the most crazy form: a shrouded figure with a samurai sword and two arm-less zombies trailing behind her on leashes made of chains. I also enjoyed Laurie Holden on Talking Dead show follow up. Yngwie Malmsteen at Golden Gods Awards! Yngwie Malmsteen will open the show at Wednesday April 11th, 2012. Revolver Golden Gods, America's only hard-rock and heavy-metal award show. The event will take place Wednesday, April 11, at Club Nokia in Downtown Los Angeles and is almost sold out. Fans without tickets can still watch the show though, as it will be broadcast live in its entirety on XBOX LIVE, as well as on the XBOX and Revolver Facebook pages. The award show live broadcast is the first ever of its kind and kicks off globally at 6 p.m. PDT/9 p.m. EDT. This is cool news, Yngwie is one of my all time favorite musicians.